When I turned 18 years old, my mother gave me a special coming-of-age present: sparkling diamond stud earrings, and how beautiful they were! I wore them out only for special occasions, and kept them in a red velvet-lined jewellery box at all other times. Sometimes I would take out the diamond earrings to admire, holding them up to the sunlight spilling through my bedroom window. The studs would catch the light, twinkling, and casting dotted rainbows on the walls. Twenty years passed, and I still tended to my earrings with the utmost of care. Now a mother of young children, I was sure to keep the jewellery box out of the reach of their inquisitive fingers. When the kids were able to reach on top of my dresser to retrieve the box, I hid it beneath my bathroom sink. They would never find it hidden behind tall paper towel rolls and ornate perfume bottles. As I showered one morning, while the kids played just outside of the tub, I noticed that the noise level was quiet, too quiet. If you’ve ever been the caregiver of a toddler, you will understand how low noise level can be tied into child mischief. As my kids were no exception to the rule, I flung back the shower curtain, only to find that they had removed all the products from underneath my bathroom sink: paper towel rolls, ornate perfume bottles, and my velvet-lined jewellery box! I dried myself quickly, and gently admonished my toddlers for creating an unruly mess. I had almost returned the products back under the sink, when I realized that my jewellery box was ajar, and the contents spilled upon my ceramic bathroom floor. With great care, I plucked up my finery and placed it back into the box. All items seemed accounted for: my grandmother’s antique brooch, clasped necklaces with pendants, rings and bracelets fit for a queen, and matched pairs of dangly earrings—but my beautiful diamond earring studs were nowhere to be seen! Immediately, I organized a search party for the missing earrings! My husband and I got down on our hands and knees and scoured the floor, the court-around, and opened the air register in case the earrings had rolled inside. The floor was white, which made the task harder to locate silvery-white diamonds. No earrings. Then it struck me: perhaps my toddlers had swallowed the diamonds and they could be working their way out! Even with my hawk eyes on the prize, no diamonds reemerged over the days to come. But I did not give up, and thought that perhaps the earrings were still camouflaged by the white, ceramic floor. But my hopes were shattered, when my husband forget about the missing earrings later that week, and detailed the entire bathroom floor with the vacuum cleaner hose. 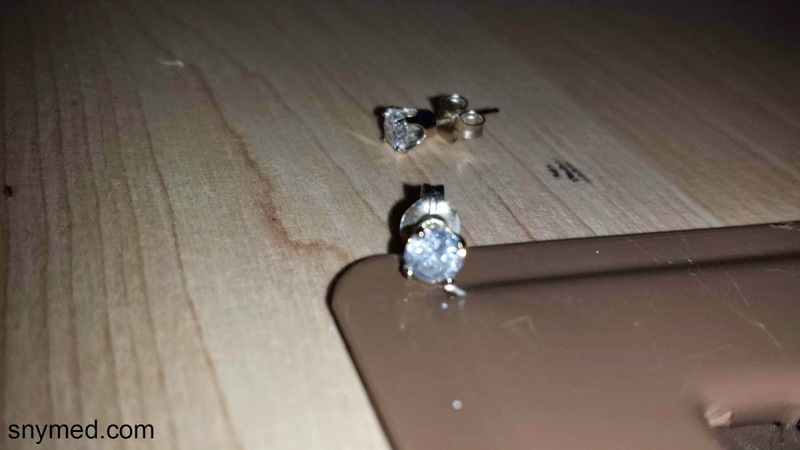 My beautiful, beautiful diamond earrings were lost for good! I did not have the heart to tell my mother what had become of her heart-felt gift. Another five years passed, and we were packing up our old home to move. The kids were considerably older and wiser, and by then I had recounted them the story of the lost-forever-diamond-earrings, which always ended with their dad accidentally vacuuming them up. As I packed up the contents of the washroom, I moved to the toiletries beneath the sink. This act took several hours, as the area was heavily packed with supplies and trinkets, and much sorting and discarding was necessary. I worked from left to right, and pulled out the velvet-lined jewellery box last; it would need to be packaged carefully. I frowned beneath the sink, because it was dusty with small strips of paper and plastic strewn beneath. It would need to be sucked out with the vacuum hose before the new owners moved into the house. I turned on the suction, and started to quickly clean every hidden nook and cranny. When my hand brushed over a little something that rolled, I almost didn’t stop to investigate. I picked up that “something”, only to stare goggle-eyed at one of my lost-forever-diamond-earrings! 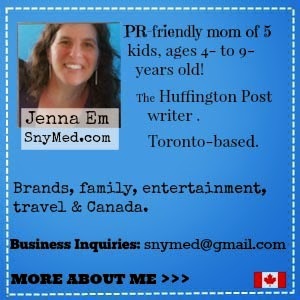 I started to shout: “Come quick!”, which got my kids and husband rapidly into the washroom. “I found one of the long lost diamond earrings! It has been under the sink all these years, and I almost sucked it up!” Everyone cheered. After I had shouted it, I realized that after all these years, the chances of finding the matching diamond stud earring was improbable. And if it had also been beneath the sink, I had likely already sucked it up. With a full vacuum bag, the odds seemed even worse. My family and I combed underneath the sink, and turned up nothing. 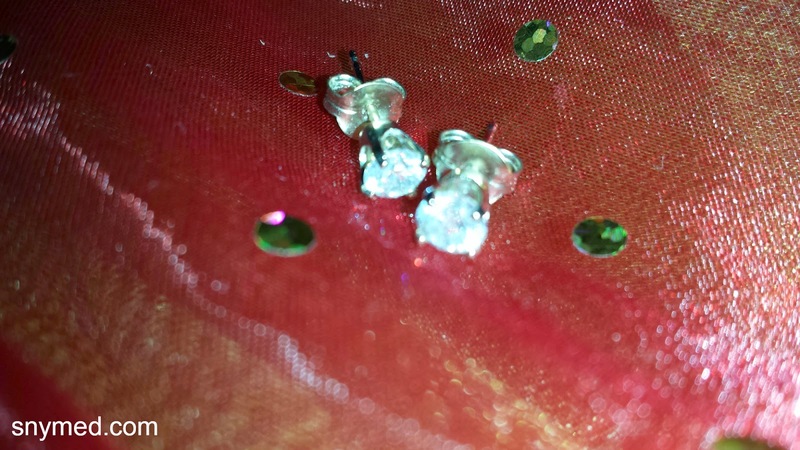 It seemed so close, and yet so far away, to have only recovered one diamond stud earring. One could only wear a pair, naturally. And then, in the dark cupboard, lodged tight in a wall crack, I found the diamond stud partner! I smiled from ear to ear, and put on the earring set immediately. Then I called my mother to tell her the story; she had not realized that the earrings had been missing all these years. Today the diamond earrings are still safe and sound, and I look forward to passing them on to my daughter one day. When I give them to her at that time, I’ll ask her if she remembers the story of The Lost Diamond Earrings, and ask her to tell the same story to her daughter--when she bequeaths them to her one day. Have you ever lost something precious to you? Did you ever retrieve it? That's awesome you got it back. My mom gave me a nice set of diamonds for grad that I always wore. I lost one in a club. I was so mad. I lose earrings often, they just fall off. oh I can imagine how heartbroken you must have been! Such a miracle they turned up after all these years, and just in time too if you are moving out! I love this story! Totally made me smile! What was once lost has been found. I let out a big "YAY!" when I read that you found your earrings. Amazing how things can go missing so easily when you have little kids. Glad you found the diamond earrings! What a great story, I'm so glad it has such a happy ending! Amazing story, Sometimes when I Can't find stuff I find it later on stashed in a weird place because my cat loves to just hide my things! I love that you were checking diapers for them... Glad they made it back to you! I am so happy you have it back!